Who Framed Roger Rabbit (Kilian Enterprises, 1988). Gold Mylar One Sheet (27" X 41") Jessica Rabbit Style D. Animation. Starring Bob Hoskins, Christopher Lloyd, Joanna Cassidy, Charles Fleischer, Stubby Kaye, Alan Tilvern, Richard Le Parmentier, Lou Hirsch, Mel Blanc, Tony Anselmo, Joe Alaskey, Russi Taylor, Richard Williams, Wayne Allwine, Pat Buttram, Jim Cummings, Jim Gallant, and Kathleen Turner. Directed by Robert Zemeckis. An unrestored poster with bright color and a clean overall appearance. It may have general signs of use, such as slight edge wear, creases, and minor surface scuffs. Artwork by 2263 Graphics, with poster design by Dayna Stedny. Please see full-color, enlargeable image below for more details. Rolled, Very Fine-. Please see full-color, enlargeable images above for more details. 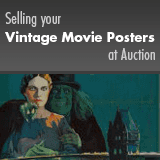 Only 45 days left to consign to the 2019 July 27 - 28 Movie Posters Signature Auction - Dallas!